You’ll note that this doesn’t appear to explicitly ban content companies paying for better service across an ISPs network. Commercial reasonability could perhaps not be “flatly illegal” in certain circumstances. So, while Wheeler paints the right tone, he doesn’t fully enforce it in the details. This could be merely a wording issue, and when the notice is released, we’ll get into its weeds. Point three is our sticking point. Its final clause is the crux of why we need net neutrality, but point three, along with points one and two do not ban the artificial speeding of content of non-affiliated parties. This is irksome. 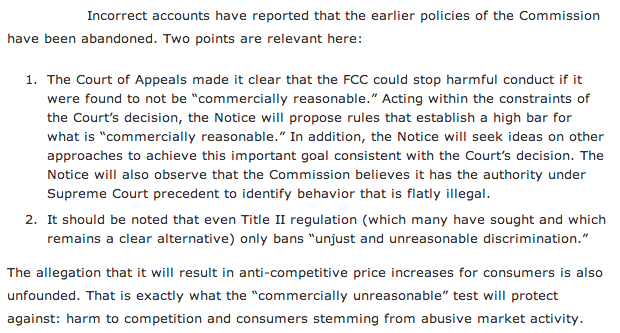 The gist here is that we are either going to have a level Internet playing field, or not. And the above doesn’t quite square the circle.